Join the discussion on our forums! Come discuss Crystalweaver over in our dedicated Crystalweaver discussion topic. This is worse than Gentle Megasaur because 2 stats multiplied is a lot worse than most adapt options [3 stats adapt or windfury preferred] multiplied. It just doesn't feel game-winning. GOD i love that voice. So funny and catchy! That is what im Tolkien about! Basically, "My Demons For Argus!" Does it buff Jaraxxus hero though? He himself is not a demon (IDK why). This card is ridiculously strong, even for zoo. 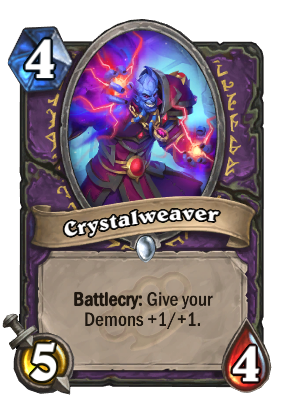 4 mana 5/4 is great statline + a positive effect. Something, warlocks rarely get. I'd personally see it being played in zoo decks, and it might be insane as a imp gang boss follow-up especially when you have some more demons. I don't get why people are confused about the text. I though Demons on board when i first saw it. blizzard specifies if it is cards on hand or in deck. Both hands exploding and still smiling like a BOSS! Another card for zoo decks. Yikes! Definitely will play this in my Warlock Demon Wild deck with Mal'Ganis, Illidan and Demonfuse. The text is unclear. Still, good card. If there is no specific "in hand" or "in deck" text, then it supposes to be on board. Like new weapon buff cards, if no text, should buff only equipped weapon. If this card was a demon also it would be in every warlock deck. Before people start assuming this means EVERY demon in your deck, it alost definately refers to demons on board. The card is pretty strong even if you hit only 1 demon you get value. 6/5 for 4 mana.